Construction is underway on the third and final stage of the $270million Circa Nundah Village, with the boutique apartment building THREE Nundah Village expected to be completed by the end of 2019. The nine-storey residential building THREE Nundah Village will add 120 spacious one and two-bedroom apartments to the award-winning Circa Nundah Village development, located right in the heart of the highly sought after city-fringe area of Nundah. Circa Nundah Village masterplan is a five-building development by urban renewal specialists Property Solutions, incorporating four residential apartments and a commercial office building, as well as a revamped supermarket and retail space over a number of levels stepping down from Sandgate Road. Property Solutions has appointed leading Queensland civil and construction contractor Tomkins Constructions to deliver THREE Nundah Village, with construction now coming out of the ground. Tomkins has nearly seven decades of experience in the construction industry, spanning four generations of the Tomkins family who have forged a reputation for delivering landmark projects of the highest quality within development schedules. Property Solutions Joint Managing Director David Blanck said he was happy to announce Tomkins as the appointed builders of the nine-storey apartment building. “We are excited to see construction commence on the final stage of our development with the builders currently finishing the pour of the underground parking levels of THREE Nundah Village,” he said. “The concept for the Circa Nundah Village project was to create affordable, quality apartments with a sense of community and place in a prime location within a major growth suburb. THREE Nundah Village Marketing Manager and TOTAL Property Group Managing Director Adrian Parsons said it was an exciting time for apartment buyers, with cleverly-designed one and two-bedroom apartments priced from just $381,000 available in the final stage of the development. “Sales for THREE Nundah Village have been strong with over 70% already sold, due to the high demand for village-style living on the city fringe with all major infrastructure on its doorstep,” he said. “The two-bedroom apartments have been extremely well designed, with bedrooms on opposite sides of the apartments, and the second bedroom features dual access to the main bathroom, effectively creating two master suites and therefore being ideal if buyers wish to share their living environment. “Priced from just $482,800 this design is ideal for anyone considering sharing, or for small families seeking more space. 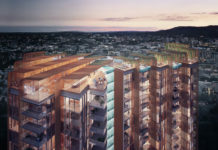 “Both owner-occupiers and investors are recognising the unique opportunity presented by this contemporary new development, as inner-urban areas like Nundah are becoming increasingly popular with a limited availability of new apartments. “Property Solutions are urban renewal specialists who have created some of Brisbane’s most iconic developments in areas like Nundah that are in the process of transforming into boutique retail and dining hubs. “If you haven’t driven through Nundah in the past few years, you will be surprised at the unique village-like atmosphere that has been created since the bypass moved traffic away from the shopping strip. “Circa Nundah Village compliments the existing shops along Sandgate Road and surrounding areas, injecting a chic modern aesthetic with stylish inner-city living to provide a real sense of style and sophistication. THREE Nundah Village features one and two-bedroom apartments with a recreational area and viewing deck on level 8, and a swimming pool on the ground floor. The development is located within Circa Nundah Village on the corner of Aspinall and Station streets in the city-fringe hot spot of Nundah – 8kms from Brisbane’s city centre, 7kms to Brisbane Airport and only minutes from some of Brisbane’s best shopping precincts including Toombul and Chermside.